PeopleSize 2008 is the latest version of the reference visual anthropometry software. The most up-to-date data available for Western populations, to 2005-6 values. It is the largest dataset with up to 289 individual anthropometric dimensions. The PeopleSize visual interface means you can find the data you need intuitively, with no learning curve. Any percentile you like - this and other important calculations are all are done for you. Since 1994, PeopleSize is the anthropometric data the market leaders use. Imagine your design being used, and click on the icons you "see" will be relevant - the natural technique of visualisation. Each icon brings up a corresponding illustration. 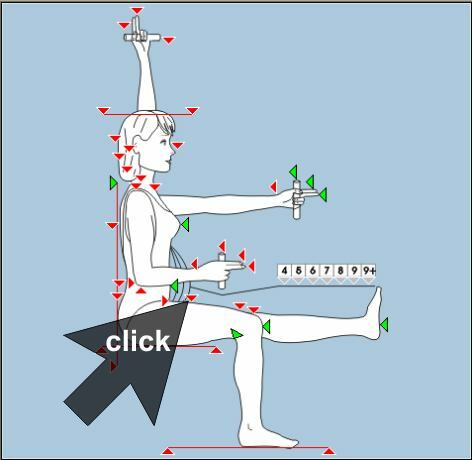 To select anthropometry data just click on markers on the body drawings. The triangles mark the measurement landmarks. As you float the cursor over them, the connected triangles turn green, showing the anthropometric dimensions available. The visual method means it is easy for you to find dimensions relevant to your design. You don't need to know any obscure medical terminology or hunt through tables of data. When you click on the second triangle, the data are presented.